Continuing now with the signs of change (2006) and the actual changes (2006-2010). To follow along, open a second window in your browser, and go to Tenth Avenue 2006 & 2010 Part One: 14th Street — 72nd Street and scroll or click through to image #112. As before, I’ll take the corners of each intersection in the clockwise order NE, SE, SW, NW. At each corner I'll describe the 2006 sign(s) of change first, then the 2010 sign(s) of change. SE — 2006: none; workmen; 2010: Ramses Deli new tenant or just new awning/signage? NW — 2006: none; 2010: window frames repainted — new restaurant tenant? In 2006, 19 out of 60 corners (32%) showed signs of change. In 2010, compared with 2006, 44 corners (73%) show actual changes, many of them major (new buildings up, old buildings gone). Yesterday (May 30) I got myself into the city — it was a really gorgeous afternoon — and photographed the corners from 73rd Street up to 110th Street for the "then & now" (sub)project. The light couldn't have been better, except towards the end of the shoot, coming back down the west side of the Avenue (shooting the east side corners) I ran into some problems with flare (this happened shooting the stretch from 13th to the 34th too) of a kind that I've never had before (same lens for this project for over four years now) so something's up that I need to figure out and take care of it. Yesterday's shoot included one of my favorite corners on the whole island: Tenth (in this stretch called "Amsterdam") and 104th Street, the northwest corner. 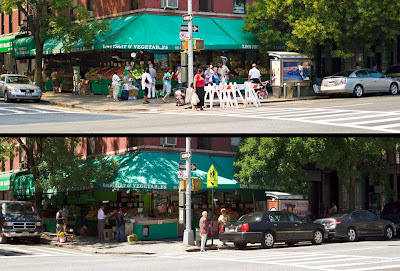 I'm not sure what I like about it so much, maybe it's the particular green of the store awning against the particular red of the brick building (see below — and if you click on the image it will open up much larger so you can see what I'm talking about a little further on in this post). Just for fun I've adjusted the cropping so that two photographs match as much as possible in this respect, and also adjusted the white balance, though that only partly overcomes the time of day difference (2006 closer to 5 PM, and later in the summer (compare the trees on the right), 2010 around 3 PM late spring. It would be even more fun to have all the then & now photographs cropped and otherwise adjusted to match as closely as possible, but that's a project of such enormity that I'm just not going to give it another thought. (I might eventually do it for a relatively short stretch of the avenue though, if and when this "then & now" thing gets a little more focussed. It'll be a few days, maybe even the end of the week before I get the "then & now" set put together for this stretch, but in the meantime I thought I'd put up that favorite corner, essentially unchanged since 2006 …. What gives this corner its main character hasn't changed: Kim's Fruit & Vegetables (and Fish Market on the left), the green awning, the red (painted, I think) brick, the trees left and right. Unchanged (almost) — sometimes that's the way I like it. Take my word for it, it's peculiar to find oneself in the position of being a rank beginner in a field in which one has a Ph.D., as I do in sociology. This sort of thing can happen, especially, I would think, in the "hard" sciences, when some theoretical or even empirical advance renders the prior knowledge of its practitioners more or less obsolete, or at least in need of serious rethinking — the settled "truths" of Kuhn's so-called "normal" science become unsettled — in much the same way that "settled law" can be unsettled by an audacious Supreme Court decision — and everyone is a beginner again. Or it can happen, much less glamorously, in fact quite unglamorously, as it did in my case, because the combination of external circumstances and, no doubt, personal failings or inadequacies conspired to prevent the expected consequence of getting a Ph.D. in field like sociology, namely an academic career. And now, nearly thirty years later, I find myself starting to "do" a kind of sociology again, not out of any grand sociological ambitions such as motivated getting the Ph.D. — and who knows, I might have done better had I been able to do the Ph.D. without such grand, not to say grandiose, ambitions — but rather as a kind of unexpected and somewhat indirect consequence of the New York in Plain Sight project. I won't bore you — not today, anyway — with how that came about. But however it happened, and however (possibly) irrelevant its etiology, the fact is that I've found myself starting to think about "sociological" kinds of questions in relation to the photographs of New York in Plain Sight and what might be done with them, at least by me. And it's a peculiar sensation, having lots of dimly remembered questions and even more dimly remembered answers rattling loosely around in my head — to say nothing of a whole card catalog (remember those?) strewn about all over the brain pan — as I start to try to make some sense of New York in Plain Sight not as a documentary project per se or an esoteric work of art on perhaps too grand a scale, but as a data set: broadly conceived, a body of recorded information to which one can turn with questions, even conjectures, and find answers, or confirmations, or refutations. And at the same time, I want to respect the photographs as photographs — not in order to make great claims for them as such, but rather to limit, or quasi-limit — "loosely restrain" is perhaps a decent first approximation — the scope of the questions, eventually, to what can be dealt with via the photographs themselves, or in conjunction with similar, and closely related photographs (as in the "then & now" set I'm assembling for Tenth Avenue and working through on this blog). I have a idea, probably exaggerated, of a "real pro" in almost any field of inquiry as being someone who knows what the questions are, what the approaches are, the methodologies, the tools, etc., and who has the skills and experience to proceed directly and forthrightly towards analyzing the questions and reducing them to a manageable number, deciding on an approach or a methodology and some relevant tools, and who can then proceed "into the field" and produce at least a workman-like "professional" result within a reasonable amount of time, say a year or so for a small study (longer, of course, for one with a larger scope). There may even be people like that — I've met some who I think match this description, and who even do work that interests me, that I admire, and who — let's face it — I envy. But that's not me, not in this field, not now, anyway (maybe someday). On the other hand, there may be merit in being a rank beginner, especially a rank beginner again. What's that classical Greek proverb we had to learn, "archae hamisu panton" / "beginning is half of all"? It's not often one gets to be a beginner again, especially as one gets on a bit in years (I'm 64 going on 65), and it may be useful, insofar as it's possible, to get over the sense of being a sociologist manqué and get on with the doing of some sociology. And to pay a lot of attention so to speak to "the phenomenology" of all the floundering around that's attendant upon being at such a beginning. Not because I think my flounderings are anything special (except to myself of course) but because we — and here I do really mean the collective "we" and in a very broad sense — usually don't pay much attention to what happens in this very early, formative phase of an activity, a project, an inquiry, when we're more or less completely "at sea" and have scarcely any sense of direction, of what we're doing, beyond a vague hunch that "there's a pony in there somewhere." So this blog is becoming a sort of double set of "field notes": one being my notes on my looking at the photographs of New York in Plain Sight", the other being my record of the process of beginning again as I experience it, day by day, sometimes even in the very process of writing about it. Maybe that will be interesting or useful to some readers some of the time, or sometime, and then again, maybe not. One of John Cage's great stories in Indeterminacy concludes with the admonition that if you find something boring after looking at it for a minute, look at it for two minutes; if you find it's still boring, look at it for four minutes, then eight, sixteen, and so on. Eventually you'll find that it's not boring at all …. I do hope John was right about that. What makes an area a neighborhood? Sometime, I believe it was in the 1990s, the New York City Planning Department published a lovely map of the city's neighborhoods, a current version of which can be found here. From this map, we can see that the southern end of Tenth Avenue is in the West Village, and then passes, successively, northward, through Chelsea, Clinton (formerly "Hell's Kitchen"), Lincoln Square, the Upper West Side, Manhattan Valley, Morningside Heights, Manhattanville, Hamilton Heights, Washington Heights, and up into Inwood, where it ends at Broadway/218th Street, just a couple of blocks below the northernmost intersection on the island, where Ninth Avenue crosses Broadway again at what might have been 221st Street, were there any such. The map's makers cleverly sidestepped the issue of neighborhood boundaries, and just put the labels more or less squarely in the middle of the named area. Nevertheless, there must be some sort of boundary or at least transition zone between a given neighborhood and the neighborhoods adjacent to it. At some point we recognize that we're no longer in Chinatown but are now in Little Italy, or have gone from Gramercy into Murray Hill, and so on. Neighborhoods are not only real estate developers' fictions, though they are — and always have been — that too. Especially for people who live "in" the neighborhood of a neighborhood, i.e., either actually in the neighborhood, or adjacent to it, these areas have, or are perceived as having, a very definite core character, something that makes them recognizable, at least to the initiate, as one rather than another, as the Upper West Side rather than, say, the Upper East Side, as Hamilton Heights rather than the Lower East Side — even though (the reader is invited to verify this at New York in Plain Sight) they may share similar kinds of architecture or even nearly identical buildings or, especially, building ornaments, or signage styles, or demographics. What can we say about this (reminding ourselves to be fearless in the face of apparent trivialities)? Well, in the first place, a neighborhood is a contiguous area of some size, spanning at least, let's say just for argument's sake, two or three avenues east-west and twenty or thirty blocks north-south (or the equivalent of this in the off-grid areas of the city). A neighborhood is further such an area as is self-defined, self-identified as such by the people who live and/or work there or in adjacent neighborhoods, and to some extent, by everyone in the city who has some sense of its neighborhoods. Of course, there's no single answer to that question, but one of the most important answers is in terms of ethnicity, based on the ethnic origins and culture of a more or less homogenous population of immigrants who lived and/or worked in a given area for a long enough time — several generations — to give it their unique stamp. So, obviously, Little Italy, Chinatown, Kleindeutschland ("Little Germany" — no longer recognized as such but included in what is now called the "East" Village — a nominal upscaling of the northern end of the old Lower East Side. And also the unofficial but no less real Korea-towns, Little Indias, Little Odessas, and so on. Or partly by a combination of geographics and the demographics of wealth: the Upper East Side, the Upper West Side (though the the cyclical fortunes of the Upper West Side show that the import of these designations can vary considerably over the years). Or by some prominent geographical feature, again, usually combined with some fairly specific demographic, e.g., Murray Hill, Morningside Heights. Or by some prominent historical feature, e.g., Fort Washington, Fort George, Wall Street. Or named after formerly independent towns or villages, e.g., Harlem, Inwood, Manhattanville, Greenwich Village. And then there are the true developers' neighborhoods: Battery Park City, Trump City/Place, Stuyvesant Town, Peter Cooper Village. And the developers' fictions: SOHO, NOHO, TriBeCa, Clinton, which subsequently became "real" neighborhoods. — Is Chelsea one of these? Of course, once an area has been established as having a given name, people will use it, and thus reinforce the sense of it as a neighborhood. This is pure speculation on my part, but I imagine that the social class/status of an incoming group has some effect on its ability to call a neighborhood after itself, especially if the neighborhood already has a well-established name. So there is, or isn't yet, a Dominican-ville, and the great African-American migration of the 1920s-1940s into Harlem didn't produce a name change, though the somewhat later Hispanic immigration did lead to calling a part of that area "Spanish" (sometimes "East") Harlem. Jane Jacobs gave us a vivid picture of how a "functional" neighborhood "works" with her famously intricate ballet of the urban sidewalk, but the question remains, how does a neighborhood as such come into being in the first place, a real — and even functional, in Jacob's sense — entity? Neighborhoods change, their character changes, they "decline" (poorer people move in), they "gentrify" (richer people move in), they expand (Chinatown), they contract (Little Italy), they come into being (TriBeCa), they disappear (Little Germany). How does this work? and how much does it matter? and why? One part of an answer may be that New York is famously known as a city of neighborhoods, a fact of life — or so I'm told — for every local politician: if "all politics is local," then in New York "all politics is neighborhood politics." This would seem to indicate that not only do neighborhoods have identities but that the people who live in them identify with them and, in varying degrees, with the other residents of their neighborhood who share this sense of identification. Which is to say that neighborhoods are, or can be, communities, in the sense discussed a few days ago in the post on "telling about society": areas in which people move together, follow one another, have not only a partially shared identity but also shared interests and a shared interest in promoting and defending these interests. But to what extent do they do this? And how much enough to make a neighborhood something more than a label on a map? Is neighborliness a "wired in" aspect of the human condition? Do we become, or tend to become, neighbors in the communal sense of the word, simply as a result of being neighbors in the sense of living in proximity to one another, so that our paths cross frequently, we tend to shop in the same shops, locally, our children go to the same schools, and so on? This is probably enough of raising one question after another for one post, but I shall be returning to this question, to these questions, again and again in the coming weeks and months. I'm raising these kinds of questions not because I have any high hopes of being able to answer them, but because as part of a framework for looking at the photographs of New York in Plain Sight and of "Tenth Avenue Then (2006)and Now (2010)" they may serve to keep the eye more alert for "signs of change" — or even other features of the Manhattan streetscape — than it would be without them. And because the search for good questions is an essential part of any inquiry, especially, though not only, at the beginning — and in this case (Tenth Avenue Then & Now) the process of somehow discovering good — i.e., fruitful, productive — questions has scarcely even begun. A reader of this blog, the composer and essayist Michael Kowalski (see his marvelous essay, "The Curatorial Muse"), checked in with me recently by email to chide me a little, but gently, on the question of style. The question Michael raised is, as he put it, "the tension between the breezy, conversational style and the difficult ideas, punctuated by the esoteric asides," which, has, he went on to say, "a bit of a tease to it"
Well, guilty as charged, I'm tempted to say, and let it go at that, especially after my overly-exuberant post on "telling about society," with its esoteric asides on Locke, Eliot, Husserl, and the like. So — on the one hand: apologies for that. I certainly don't want to lapse into that sort of name dropping that manifests itself conversationally in such gambits as "well, I was having lunch with Adorno last week and he said, over kritische veggie burgers at Chez Bien Pensants (you know the place I mean) …." On the other hand — what is the style appropriate to an intellectual blog that, however, wants to be read more in pursuit of the difficult ideas and less, in fact not at all, for its own difficulties? I'm aiming for that "breezy, conversational style" in the hopes of getting a clear view of the "difficult ideas," in much the same way as I hope to present clear views of the difficult subject of New York "in plain sight" in my "subjectless" photographs. But I suppose one can over do it. I surely can. Another aspect of this blog, something I'm aiming for, is to make it a kind of almost stream of consciousness diary of my own thoughts and activities, more or less usually focussed on the New York in Plain Sight photographs or problems or issues related to them. Not that I don't edit, but I do mean to leave it relatively raw, without a lot of wordsmithing. The "esoteric asides" of course can quickly degenerate, as I suppose they already have from time to time, in the direction of mindless name-dropping and showing off, but then, if that's not altogether true — and I hope it's not — then how to point in this that or the other direction, possibly even esoteric direction, without making an even bigger deal of it, which would surely be counter-productive? As usual, I'm going to beg off with the excuse that I don't know …. But I do want to offer the hope that it's possible to take ideas seriously without getting all po-faced about them at the same time (not that Michael, who has a delightful sense of humor, was suggested anything of the kind). As with everything else here — and possibly everywhere — we'll just have to keep going and see how it turns out. I have extended the set of photographs "Tenth Avenue Then (2006) and Now (2010)" to include all of the 216 street corners from 14th Street up to 72nd Street. The set may be viewed here. I am preparing two additional sets, which will carry the "then & now" concept northwards from 73rd Street up to 155th Street, and then from 156th Street on up to Broadway/218th Street. 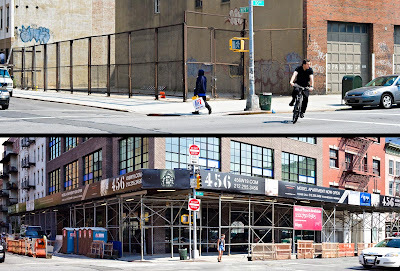 This post updates two prior posts on "signs of change" on Tenth Avenue (13th—23rd Streets and 24th—34th Streets) to include a comparative look at change, based on the photographs I took Wednesday (May 26) and assembled with the prior (2006) set. 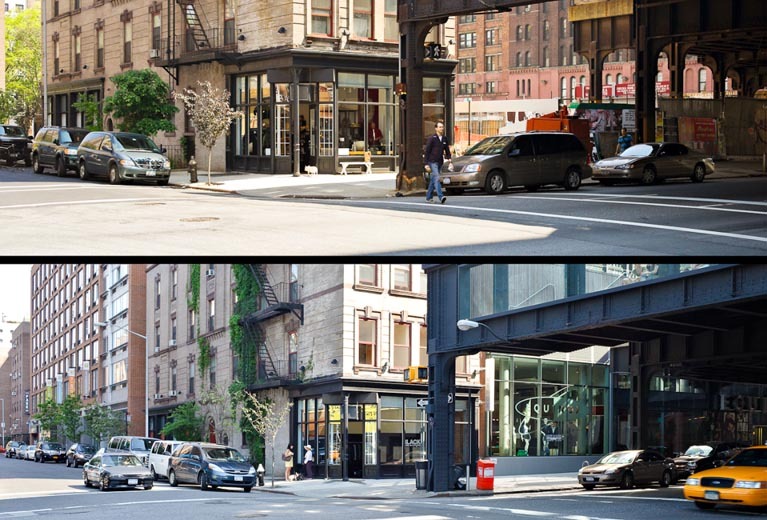 To follow along, open a second window in your browser, and go to Tenth Avenue 2006 & 2010 Part One: 14th Street — 72nd Street . 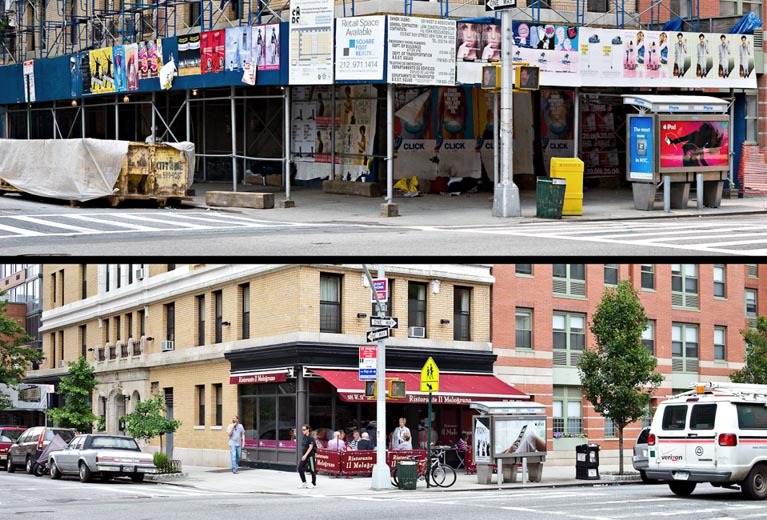 Though I start with 13th Street in the text below, the "then and now" photos only begin at 14th Street. I've not repeated the summary statistics for 2006 (see original posts for those). 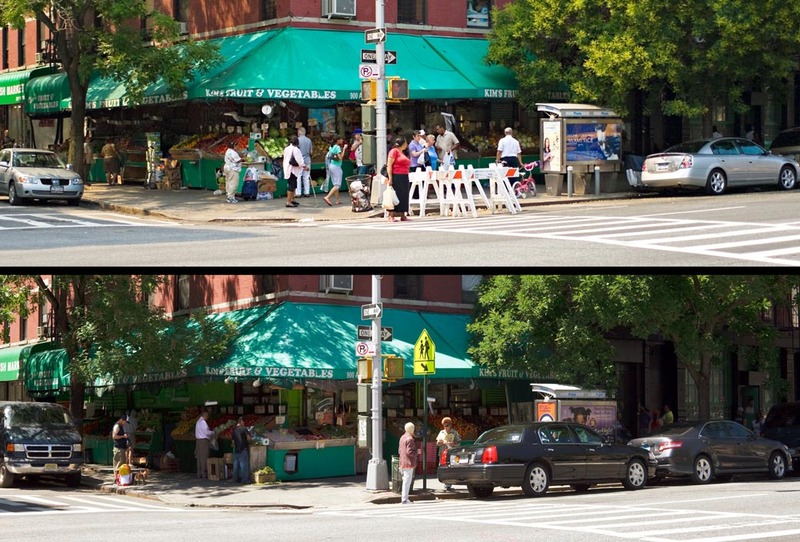 SW — 2006: no obvious signs of change in progress, but "ghosts" of prior structural elements above windows to the right betray fairly recent renovation; 2010: new awnings up — match prior "ghosts"
SW — 2006: no obvious signs of change in progress except dog breeds (but see NW); 2010: Auto Parts on corner shuttered — closed? NW — 2006: veterinarian is new neighborhood style; 2010: veterinarian closed, "for rent"
SE — 2006: none; 2010: lower deli awning gone — deli too? SE — 2006: sign: "under new management"; 2010: new signage — corresponds to "new management"? In 2010, compared with 2006, 47 out of 81 corners (58%) show signs of change, many of them major (new buildings up, old buildings gone). With this post I'm switching over to the comparative look at change, based on the photographs I took Wednesday (May 26) and assembled with the prior (2006) set. 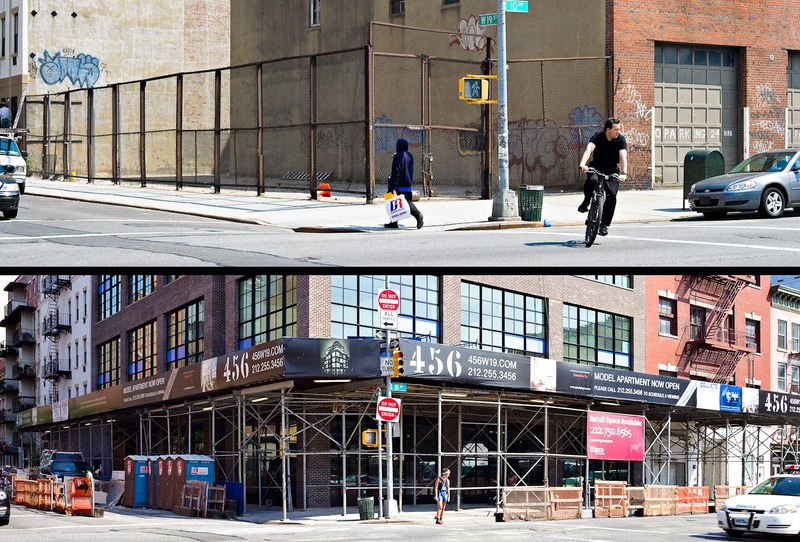 To follow along, open a second window in your browser, and go to Tenth Avenue 2006 & 2010 Part One: 14th Street — 72nd Street , and then scroll or click through to image # 076 (Tenth Avenue & 34th Street, NE). SW — 2006: none; 2010: corner shop apparently closed; awning down; wall ad on building to the left of "Taxi Parts"
SW — 2006: red-orange plastic Jersey barriers; 2010: barriers gone; "500" is now "501"
While only 9 out of 32 corners (28%) from 35th Street to 42nd Street showed signs of change in 2006, by 2010 19 out of the 32 corners (59%) had actually changed, in many cases dramatically. In the next week or so I'll be going back to the corners already covered, from 13th Street to 34th Street, and updating the posts to include the 2010 comparisons. It's still an open question, whether all this simple counting, even with the addition of the 2010 comparison photos, amounts to anything, but I'm going to stick with it, probably all the way up to Broadway/218th Street, on the grounds that even if it doesn't in and of itself yield anything directly interesting or useful to "tell about society," the process, including its tediosity, is likely to give rise to ideas that are fruitful in this regard. So please bear with me, or if you can't bear it, just drop in every now and then — there are always the more discursive posts, and occasionally one of them may strike your fancy. Then and now revisited …. I've always loved those "then and now" books: you know, photographs of New York in 1900 side by side with photographs of New York in 2000, and so on. And at the same time, with my intellectual reading glasses on, I've looked down my nose at them: fun, but not serious. Well, it's like this: since starting my crawl up Tenth Avenue looking at "signs of change," I've been feeling more and more like, yes, I can identify these signs, but what actually happened? And, of course, what's happening now? So yesterday, in all that heat — it was the hottest day of the year here so far: 95º in mid-afternoon — I went into town (as we say here on Staten Island) and photographed Tenth Avenue from 14th Street up to 42nd Street, inclusive. Soon I'll do the next stretch of Tenth Avenue, and so on, until I've reshot the whole thing, though that might take the rest of the summer to get finished. Came home, processed the images, put together a new set combining the old and the new pair-wise: old (2006) on top, new (2010) below, corner by corner. The new ones, the ones I shot yesterday, were all shot at a focal length of about 35mm, and I didn't do much cropping in from the sides, so the field of view is pretty consistent across the set. And generally wider, sometimes, though not always, much wider than the photos from 2006. Also the light was different, the white balance in particular, and the camera is different too, though the lens is the same. And my ideas about processing evolved over the past four years — the Tenth Avenue pictures were the first ones I processed way back when, and I'd do it differently today. So I compromised, and made the 2010 images look more like the 2006 images than I'd have liked, and, conversely, changed a bunch of the 2006 images to be more like what I'd go for today. But they're reasonably consistent with one another now, though not as consistent as I'd like. It ain't so easy after all, this "then and now" thing. If I'd known — isn't that always the way — that I'd ever be doing this again, I would have been much more consistent with field of view in 2006. And a bunch of nits, this and that, I won't go into it all. But I do find it amusing that, having spent a good many years, off and on, in my previous life, splicing disparate data sets together to try and arrive at usefully consistent time series (with all the data "massaging" that involves), now here I am dealing with time series construction and its problems all over again. The thing is: times series tell us a lot, or can be made to. (I'm reminded all of a sudden of that great old statisticians joke: "if you torture the data long enough, it will confess …." Be that as it may, I'll be using the comparative set from now on as I continue to wend my way up Tenth Avenue, looking for signs of change not only then but also now, and, now, also looking at the changes that actually did happen. The link to the "then and now" set is here. I've also put the link in the "links" box on the right of this page (below the "archive" list). Excursis: Telling about society …. Howie Becker called his book — well, one of his many books — Telling About Society. I like the book, I like the title. I like Howie too, though I don’t know him very well: we started an e-mail correspondence last fall, centered on the street corners project (albeit with many entertaining digressions) and I only just met him in person last week for a few hours. He’s a terrific sociologist and a good writer too. And, especially, he's one of the least pretentious people I’ve ever met. He writes that way too, which I admire almost as much as I admire the research and thinking he’s done over the course of a long and fruitful career. (Have a look at Art Worlds sometime). So the title, “Telling about Society” is very much like him: straightforward. It's easily understood, even by people who aren’t social scientists, as including all the many different ways in which people who have looked at society — which is surely everyone of us, though we may not ordinarily think of it that way (broadly conceived, this is the ethnomethodological gambit) — report or “tell” about what they’ve seen, learned, studied, whether that’s the decennial U.S. census, a Gallup poll, a community study, a documentary film, a memoir or a short story or a play, a set of photographs — even New York in Plain Sight, I’d venture to say. So bear with me while I speculate, or drop in again tomorrow or the next day when I’ve come back down to earth (assuming I’ve ever been there, or left, or can find my way back). Actually this is an old theme of mine, one that I’ve started writing about innumerable times, then always given up. Maybe that was the best idea — giving up, that is — and maybe it wasn’t, but the questions still nag, so here we are. Ever since the American Heritage Dictionary was first published some forty years ago with a concise dictionary of Indo-European roots as an appendix, I’ve been fascinated by what looking at these roots may tell us, or at least by what thoughts may be provoked by looking at them. Not to suggest that any combinations of sounds such as those imputed to these ancient roots, their even more remote ancestors, or their contemporary descendents intrinsically bear these meanings, or for that matter have ever represented any meanings at all except what generation after generation has learned anew—and with variations—to associate with them since time immemorial. But perhaps to prick the imagination a little as a way of getting started: to tell about society is to give an account of our moving together, of our following one another. Or at least to give a partial account of how some of us more or less move together, more or less follow one another, to some extent, some of the time, in some circumstances. How does this work? And why do we do it? As to how it works, put crudely, it’s “monkey-see, monkey-do” all the way, I think, i.e., to move upscale into the Greek if not on into Aristotle, it’s mimesis, plain and simple. Or maybe not so plain or simple (and I don't mean to impugn the intelligence of monkeys, either), but isn’t that what words are for? To give a definite mental locus to “a new simple idea” even though it is the result of compounding many other simple (and not so simple) ideas? (Hmmm, just moved into John Locke territory, let’s not go any further in that direction for the time being). So let’s shelve the how it works question — I’m sure I’ll find my way back to it in another post before too long (not that I have any solid answers). But why do we do it? Why do we “tell about society,” why do we recount how we move together? And what are we doing when we do? Telling about society is part of the complex process of society itself and of living in society (and in this sense, as social mammals who "fly" our conduct "by wire" exclusively via the "models" of the world we've learned and continue to learn, we are never NOT living in society): one of the ways in which we follow one another, move together, is to tell one another about how we do it. Though most of the time in most of our actions (movements), we’re following one another (however imperfectly, which is an important source of the variation that we later, retrospectively, sometimes identify as “creativity”), when we tell one another about society we’re venturing out of our “follower” mode and into a kind of “leadership,” albeit a leadership of a special kind, unlike the sort of leadership that leads a troop over a hill or a society into a depression (but not unrelated either), a sort of “bracketed” movement (… oh oh oh oh that Phenomenological rag, it’s so elegant, so intelligent — apologies, T.S., apologies, E.H, just couldn’t resist), an “as if” movement that can, sometimes, short-circuit a whole lot of more or less random milling amount (there’s a lot of “Brownian motion” so to speak in social action) and get us to a result (sometimes a blown fuse) a lot sooner. When I took a job in the Boston area in the mid-1980s I was astounded at the style of driving there. Coming from Upper Fairfield County, CT, it seemed as if the rules of the road, signage, signals, etc., were no more than a half forgotten moral framework, like the Ten Commandments or whatever, to be remembered from time to time but not really of much relevance to one’s day to day conduct as a blasphemer, idolater, Sabbath breaker, adulterer, thief, and liar (to say nothing of coveting, well, everything, but hopefuly not falling into actual murder). I mean: red light? But no one’s coming, or at least I can get through the intersection before they reach it. One way street? But I’m only going the wrong way for one or two blocks. No left turn here? That’s just ridiculous! And so on. But gradually as a daily participant in this sink of vehicular iniquity, I learned to drive that way myself, and had some rude awakenings a few years later when I came back to the New York metropolitan area. My private theory, developed while driving in Boston, was that drivers in an area teach other drivers how to drive, and they do it by driving the way they do. Much as pedestrians in Manhattan teach other pedestrians how to walk in the city (there are analogies between Manhattan pedestrians and Boston drivers, but I’ll leave that as an exercise for the reader). And so it is — this is my real thesis, or one of them: human beings never ever stop learning, not even for a millisecond. There’s nothing to be done about this, it’s just the way we are (we’re not the only animals for which this true). With inevitable result that we’re also always teaching, non-stop, never mind whether intentionally or unintentionally, formally or informally: teaching one another how to behave, how to move together, how to follow one another, in short: how to live in society. And “telling about society” is how we do this when we do it intentionally, whether formally or not, and no matter what medium we use. Jürgen Habermas said somewhere a long time ago in his work on “communicative competence” that “every language is its own metalanguage” and while I’m not going to take up the idea of society as a “language” (nor, thankfully, does he), I would say that if we regard society as the on-going collective product of our moving together, our following one another, then “telling about society” is our “meta-society,” our “meta-moving” together or “meta-following” one another, our "meta-community." And this does, I think, have a further consequence: what we are telling, and how we are telling it, and to whom, matters, has an inescapbably moral dimension, even if we can’t at all reliably or successfully or consistently lay out the sense of that dimension and what it means as a guide to how we drive or walk or do “sociology,” whether in Boston or New York or wherever else there may be people moving together, following one another …. Well now, I really have gotten myself into the deep end of the pool so I think I'll leave it at that. Continuing up Tenth Avenue … (once again, open a second window in your browser, and go to Tenth Avenue 13th — 110th to follow along, or else toggle back and forth between the blog and the photos using your browser's forward and back buttons). As before, I’ll take the corners of each intersection in the clockwise order NE, SE, SW, NW. And for this post, too, I'll list every corner and what I found. SE — sign: "under new management"
10 out of the 38 corners on Tenth Avenue from 13th Street to 23rd Street — 26% — show signs of change that are either obviously change in progress (5 corners, or 13%) or else evidence that would (I think) be apparent to anyone who knew the neighborhood of recent change (5 corners, or 13%); 28 of the corners (74%) showed no signs of recent change. Well, not so much change manifest here as in the half mile to the south. But are appearances deceiving? Actually there was more change underway in the blocks west of Tenth Avenue, on over to Eleventh, in this stretch of Tenth than in the first half mile we looked at. But in this stretch, largely, I suppose, because of the big housing projects, both private (London Terrace) and public (Elliott Chelsea Houses), Chelsea Park (between 27th and 28th Streets), the 30th Street Post Service building, and then the Penn Station railroad yards (on the west side of Tenth between 30th and 33rd Streets) the changes don't quite reach to the Tenth Avenue corners. Or, put a little differently, in this stretch, Tenth Avenue is a less permeable boundary street between the areas to either side of it. Below 23rd Street, the gentrification extends to the east as well as to the west of Tenth Avenue, whereas in this stretch it stops, mostly, just west of Tenth, so the appearance, and perhaps the pace of change is less intense here, and more of the character of the avenue as it was prior to the art galleries' move from SoHO to Chelsea remained intact — though now (2010) more change is visible than was the case four years ago when these photographs were taken. Which brings up a corollary point, namely that the big avenues in Manhattan can serve as "spines" (or main arteries, to use a different biological metaphor) for a neighborhood in one stretch and switch so to speak to being boundaries between neighborhoods in the next stretch. — Do these roles change with time and the character of the neighborhoods involved? Do spines ever become boundaries and vice-versa? And under what circumstances? — well that really would be another story, but let's keep the thought on file. — Once again, I'm proceeding tediously slowly here, at that outset, in order to force spending time with each of the photographs, even more time than (perhaps) the photographs warrant, out of an admittedly vague sense that "ideas" may result from this "contemplative immersion," especially here at the beginning of the process, that could get swamped by moving faster. Though of course, I could just be getting stuck in a lot of obvious trivia, too. A quick look ahead …. 136 out of a total of 649 corners (21%) showed signs of change in progress or more or less obvious signs of recent change. This amounts to nearly one such sign of change on average in every one of the 206 blocks on the avenue from bottom to top. The variance, of course, is the real story, if there is one. The highest density was in the first stretches we covered, 13th — 34th Streets (I'll post 24th to 34th Streets later today), with 41 out of 80 corners (51%) showing signs of change. The lowest density was from 97th Street up to 125th Street with only 4 out of 90 corners (4%) showing signs of change. Midtown, broadly defined as 35th Street to 59th Street, showed signs of change at 28 out of 100 corners (28%). Harlem, 126th Street to 168th, had only 19 out of 142 (13%). Fort Washington / Fort George, 169th Street to 190th Street, showed 8 out of 55 (15%). Inwood, Dyckman to Broadway at 218th, 16 out of 49 (32%), but this result is skewed by the extensive roadwork under the elevated tracks (and I'm uncertain about how to deal with that). These figures will surely be revised as I go up the avenue again more slowly, but are surely — famous last words — not too far off. These stats, and even the somewhat more detailed ones that the slower pass is yielding, probably don't mean much in themselves, but this sort of simple counting may show something a little further on in the project when it can be overlaid or cross-tabbed with other features. 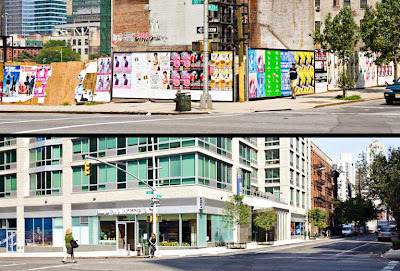 A brief note on "signs of change"
I just looked ahead through the next few miles of Tenth Avenue, that is, from 24th Street on up to 72nd Street, just to sort of get a "preview" of what I'll be looking at more closely in the coming days. And found myself thinking about the "signs of change" that I'm watching for in this pass along the avenue. Certainly there are obvious signs, signs that you wouldn't miss even if you were from Ulan Bator and just visiting for the afternoon: buildings under construction, or being demolished, scaffolding, safety netting, and other equipment, windows boarded up or papered over, fresh paint or tuckpointing or obviously (?) new facades not in keeping with the character of the obviously (?) older buildings around them. And as we saw, there was a lot of that in evidence on the Tenth Avenue corners between 13th Street and 23rd Street, though rather less of it as we got closer 23rd Street. Then the less obvious signs: a chic home furnishings shop in a neighborhood where that is, or until recently was, an anomaly, if not altogether inconceivable; younger people with fashionably upscale dog breeds and an upscale veterinarian to service them in a neighborhood where previously dogs were mutts and took care of themselves without any veterinarian; people in fashionable business or casual attire in a what was for decades a strictly working class neighborhood, and so on. Or as we might say, the visible signs of gentrification's invisible graces of class, status, power, education, and so on (I may be getting carried away here, but perhaps the exaggeration, if it is one, will get the point across). where does a neighborhood begin and end? what are it's boundaries? how fluid are they? more specifically, what are the visible signs of a neighborhood's being a neighborhood? in architecture, commerce, signage, street life, appearance of people on the street, maintenance and upkeep of the sidewalks and streets — clean or littered, freshly paved or pot-holed? since neighborhoods change their character as well as their boundaries, what is the temporal extent of a neighborhood's character? (What is now the Upper West Side was initially rural, then a shanty town or series of shanty towns, then was "gentrified" in the 1880s-1890s, then slipped back again into disrepute, becoming a "slum" by mid-century, revived in part by the Lincoln Center "urban renewal" project, and now once again tremendously fashionable (and expensive). This is a very crude estimator, but one could say, in the roundest of numbers, that each of these phases has covered on the order of 50 years, with the characteristic of each phase centered on, say, the middle twenty or thirty years, the time in between being "transitional." I'm just shooting in the dark here, playing around with the notions in advance of really finding out what I might be talking about. This isn't an entirely idle question, if we're concerned not only with how a neighborhood evolves but how people come to identify themselves as being from that neighborhood, and how people know when they've walked from their own neighborhood into another one, just by what they see (and hear and smell). And if we're interested in how people "on the street" and "in the neighborhood" perceive change, then we would want to know what the time frame is in which the change is perceived. And that depends on the time scale of memories — and the shared memories — of the people living in or working in or regularly coming to or passing through the neighborhood. Meaning, I suppose, that a neighborhood with high turnover of people is perceived by them "on average" on a shorter time scale than a neighborhood with a relatively stable population. Of course, there would be, and are, different time scales operating simultaneously. When I moved back into the city nearly twenty years ago, I lived in a fourth floor walk-up on 15th Street, just off Sixth Avenue, next to the old New York State National Guard Armory. It was a non-neighborhood, situated in between the Flatiron, Union Square, Chelsea, and Greenwich Village neighborhoods, with none of their amenities and none of their character either. I was there for about nine years. When I moved in, the street, especially in front of the armory, which had a substantial overhang over the sidewalk on the south side of the street, was home to a lot of homeless people. Fourteenth Street, a block to the south, was still pretty sleazy, and Sixth and Seventh Avenues heading north were no great shakes either, at least for the first few blocks. 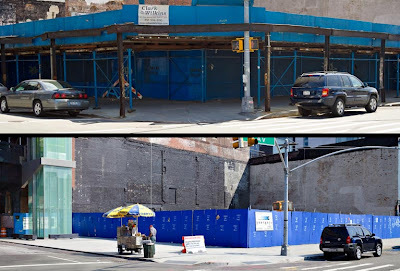 The renovations began (they'd probably already begun and I didn't know it because I wasn't there then): scaffolding went up around the big building on the southeast corner of Sixth Avenue and 14th Street along with signs advertising "luxury condominiums." Down the block on 15th Street going west a few landlords began to spruce up the facades of their buildings. Going east a chic tile shop appeared, and an upscale toy store. Rumor had it that the armory would be torn down for something else, a CostCo or whatever. Some of the old buildings on Sixth Avenue north of me were demolished, and similarly on Seventh Avenue, and new high rises began to go up. I left when the noise from the demolition of the armory and the construction of the new building made living where I was impossible for me (I lived right next door). I'm fairly often back in that neighborhood, and sometimes walk past the building where I used to live. No doubt the neighborhood has changed enormously since I moved there. And is still changing, though the pace has slowed since the start of the depression now already nearly two years ago or more. Now some of these changes were unmistakable: the demolition of the armory took over a year and the building was so large (it faced both 14th Street on the south and 15th on the north and was about half a block long) was the most striking — and then the construction of its replacement took another couple of years. So: huge, big, long, exceedingly visible (and, alas, audible). Other changes were faster: repaving Sixth Avenue (overnight), Bed Bath & Beyond opening (months and months of signage before the actual opening), one of the second hand book store on 18th disappearing (with 30 day going out of business sale), and upscale paper shops moving in, and so on and on and on — it's a familiar story. And no doubt a similar range of time frames when a neighborhood is in decline, which is to say, when it becomes more attractive to poorer people than had previously been its main demographic. Not sure, as usual, where this is heading, but wanted to spend some time on these thoughts (and experiences, too). the longest window, which is defined by the whole piece itself, which he (notoriously) called the "Urlinie" — the primordial or fundamental line of the piece. And continuing into a further digression, the wonderful essay from now 50-60 years ago (originally, I believe, a lecture at Darmstadt) by Karlheinz Stockhausen that posits and then explores the idea of a continuum between rhythm and pitch, i.e., the implications of a sliding scale of time frames or metrics. And a further bit of an afterthought: is a look at "signs of change" actually a look at the overlay of nevertheless distinguishably different time frames? time frames that overlap, moreover, and modulate our shared experience — even our sharing of experience — of change in the city, if not elsewhere or even everywhere? This evening, or tomorrow morning at the latest, back to the next segment of Tenth Avenue and its concrete signs of change, from 24th Street up to 34th Street. Why Tenth Avenue? And a few stats …. "Never apologize, never explain …." Do you have Avenue A and 6th Street?